Yesterday we learned that the January orders for durable goods were up a solid 2.8%. Most analysts were looking for a figure closer to 1%. This morning investors were relieved to hear the fourth quarter GDP is estimated to be at 2.2%, a smidgen above estimates of 2.1%. In general, a 2% growth rate isn't necessarily cheer-worthy, but in today's environment in which good news will hasten higher interest rates, it is a comfortable expansion rate. Meanwhile, the February Michigan Sentiment settled at 95.4 to beat expectations, and confirm consumers are feeling confident in the economy. Of course, consumers aren't always the best indicator of economic stability. You might recall consumer confidence readings were "off the chart" just before the 2007/2008 equity market plunge. Perhaps their comfort is a bit of a contrarian indicator. Treasuries rallied from last week's lows, but it appears to have been a run-of-the-mill correction. We expect prices to resume the down-trend next week. However, a break above 164 in the June 30-year bond would be an "all bearish bets are off" type of signal. In our view, speculation of inflation in Germany could finally work against the price of global fixed income prices (including U.S. Treasuries). Also, data in the U.S. has been relatively stable, and so have the financial markets. These two factors "should" keep the path of least resistance to the down-side as traders move money away from government fixed income and into riskier, but better yielding, assets. *BEWARE - Due to the fact that the U.S. government ceased issuing 30-year bonds from 2001 to 2006, the deliverable bonds against the June ZB futures contract have longer expiration dates, and therefore longer duration. As a result, they will be far more sensitive to interest rate changes (volatile) than the March contract was. The volatility in the June futures contract could be as much as 3 times that of the March contract. Be sure to account for this in your trading! **Consensus:** As long as the mid-to-high 163 resistance area continues to hold, the bears should be in control. We are looking for a probe to 157ish. 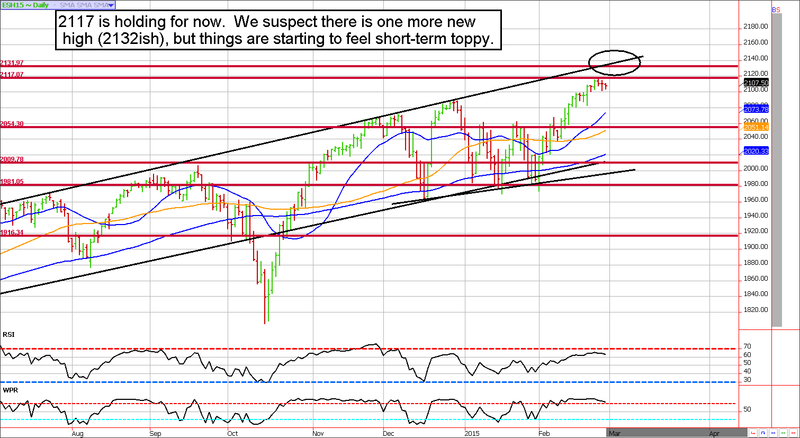 We are starting to turn short-term bearish in the S&P. However, strong seasonals in March leave us looking for one more leg to the rally before a correction ensues. March has historically been the third best month of the year for the bulls. Of the previous 21 years, we've seen 14 up days and 7 down. The average gain has been about 1.5%. Nonetheless, March has been stamped with a reputation for turbulence (both bullish and bearish waves of volatility). As positive as seasonals are in March, it has also had a tendency for swift late-month selling. Thus, we like the idea of getting bearish from better levels (preferably 2132ish or above. **Consensus:** We'd like to get bearish should prices see the 2130ish level, or above. February 11 - Lock in gain on March Euro 118.50 call, sell the 116 call near 35 ticks. February 19 - Buy back April crude oil 63 call to lock in gain of $600 per contract before transaction costs. February 20 - Buy back April crude oil 42 put to lock in a profit on this leg of somewhere between $350 to $400 per contract before transaction costs. February 24 - Exit March Euro 116/111 strangle to lock in the profit (about $550 to $600 per lot before transaction costs).